For hundreds of years, societies have maintained a certain fascination with the bizarre and the unknown. In the past, persons with congenital disorders that cause excessive body-hair growth have been so dramatized and romanticized that individuals with rare hypertrichosis syndromes became crowd-drawing money-making phenomena in many 19th century sideshow acts. Most famously, Fedor Jeftichew, aka Jojo the Dog-faced boy, was exhibited by PT Barnum in the United States in the 1800s. Disorders of hypertrichosis are distinguished by the distribution of hair, as well as by the temporal pattern of growth, the possible associated congenital anomalies, and the possible inheritance pattern. Congenital hypertrichosis lanuginosa (CHL) has been referred to variably as congenital hypertrichosis universalis, hypertrichosis universalis, hypertrichosis lanuginosa, and hypertrichosis lanuginosa universalis. The lack of definitive terminology can be confusing and may make the distinction of the related but unique hypertrichosis syndromes difficult. [1, 2, 6, 7, 8, 9, 10, 11, 12, 13, 14, 15, 16, 17, 18, 19, 20, 21] Several solitary case reports describing hypertrichosis resembling congenital hypertrichosis lanuginosa in association with other physical findings may, in fact, represent variants in a spectrum of the disorder. An X-linked syndrome of hypertrichosis associated with gingival hyperplasia has been described. The abnormally excessive body hair that these patients develop is of the terminal type, and this disorder will not be greatly discussed. However, the X-linked syndrome of hypertrichosis associated with gingival hyperplasia is often confused with congenital hypertrichosis lanuginosa. Of interest, Julia Pastrana (1834-1860), one of the most famous persons with generalized hypertrichosis, was long thought to have congenital hypertrichosis lanuginosa. After her death, her hairs were found to actually be terminal in nature, indicating that she likely had hypertrichosis with gingival hyperplasia and not congenital hypertrichosis lanuginosa. This illustrates the need to accurately determine the type of excess hair present on a given patient. In addition, the localized hypertrichoses, including primary hypertrichosis cubiti (hypertrichosis of both elbows), primary cervical hypertrichosis, and primary faun tail deformity, are not addressed in this article. 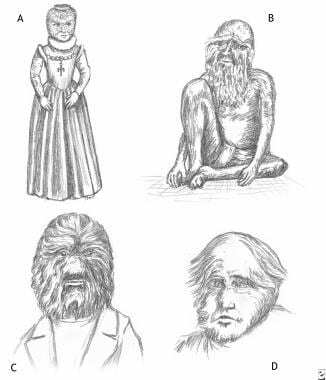 These forms represent limited types of hypertrichosis that may be associated with underlying bone and neurologic abnormalities. Hence, they can be distinguished from congenital hypertrichosis lanuginosa on the basis of their clinical presentations. In 1648, Aldrovandus first documented a family with hypertrichosis. Originally from the Canary Islands, Petrus Gonzales was brought to France as a curiosity for the nobles. He, his 2 daughters, a son, and a grandchild were affected. This kindred was dubbed the Family of Ambras after a castle near Innsbruck where their portraits were discovered. Over the next 300 years, more than 50 similar-appearing cases were described, and 34 patients with presumed congenital hypertrichosis were identified. In 1873, Virchow described an edentate form; in 1876, Bartles added the descriptor "universalis;" and, in 1890, Chiari called the syndrome "hypertrichosis of the dog-men." Family of Petrus Gonzales, who lived in the 16th century. The hairy family of Burma has a 4-generation pedigree of congenital hypertrichosis lanuginosa dating back to 1826. Earlier generations were in the employ of the Ava court, but later generations often earned a living as sideshow attractions in the 1880s. In 1993, Baumeister et al noted that 9 of these 34 patients with hypertrichosis had a distinctive clinical presentation. The term Ambras syndrome was coined, and subsequent genetic analyses in 2 patients have revealed an association with a paracentric inversion of band 8q22. Patients in well-documented cases of Ambras syndrome. (A) Daughter of Petrus Gonzales. (B) Grandson of Schwe Maong. (C) Adrrian Jepticheff. (D) Fedor. Two types of excessive hair disorders exist and must be distinguished. Hypertrichosis is non–androgen-related pattern of excessive hair growth that may involve vellus, terminal, or lanugo type hair. Hypertrichosis can accompany certain genetic syndromes, or it can be induced secondarily by exogenous medications, most notably phenytoin, minoxidil, cyclosporine, diazoxide, corticosteroids, phenytoin (Dilantin), streptomycin, hexachlorobenzene, penicillamine, heavy metals, sodium tetradecyl sulfate, acetazolamide, and interferon. The pathogenesis of congenital hypertrichosis lanuginosa is unknown. Congenital hypertrichosis lanuginosa is believed to be inherited in an autosomal dominant manner; most cases involve a familial component. Variable expressivity of inherited characteristics is noted. The specific genetic abnormality in congenital hypertrichosis lanuginosa has not been defined. No known hormonal or endocrinologic abnormalities have been identified. A genetic etiology is proposed for Ambras syndrome. Some postulated that the common breakpoint in both patients at 8q22 suggests that this region of chromosome 8 contains a gene involved in regulation of hair growth. Although the relationship of these genetic observations to the pathogenesis of hypertrichosis remains uncertain, it has been postulated that the common breakpoint in both patients with Ambras syndrome at 8q22 suggests that this region of chromosome 8 contains a gene involved in regulation of hair growth. Congenital hypertrichosis lanuginosa and Ambras syndrome have no geographic predilection. In both congenital hypertrichosis lanuginosa and Ambras syndrome, excessive hair is apparent at birth. Individuals with Ambras syndrome are classically described as having hypertrichosis at birth; however, the quantity of the excessive hair may be limited at that time. Unlike congenital hypertrichosis lanuginosa, Ambras syndrome may show increased hair growth in both distribution and density as the patient ages, and the hair does not spontaneously involute. In Ambras syndrome, patients are described as having increased hair growth throughout their lifetime. Congenital hypertrichosis lanuginosa is not associated with an increased mortality rate. No documented long-term medical or physical morbidities are associated with congenital hypertrichosis lanuginosa. Psychological sequelae may occur because of the presence of excessive hair growth and the maintenance involved with removing the unwanted hair. Patients should be aware that hypertrichosis may have a genetic component, and therefore may be inherited by subsequent generations. Patients should be aware that the genetic basis for congenital hypertrichosis lanuginosa has not been identified, but the overall health of individuals with hypertrichosis is good. Brandt A. Uber die sogenannten Hundemenschen, beziehungsweise uber Hypertrichosis universalis. Biol Zbl. 1897. 17:161-79. Felgenhauer WR. [Hypertrichosis languinosa universalis]. J Genet Hum. 1969 May. 17(1):1-44. [Medline]. Baumeister FA, Egger J, Schildhauer MT, Stengel-Rutkowski S. Ambras syndrome: delineation of a unique hypertrichosis universalis congenita and association with a balanced pericentric inversion (8) (p11.2; q22). Clin Genet. 1993 Sep. 44(3):121-8. [Medline]. De Raeve L, Keymolen K. Congenital hypertrichosis lanuginosa in a father and son. Arch Dermatol. 2011 Jun. 147(6):746-7. [Medline]. Gupta LK, Khare AK, Mittal A, Garg A. Congenital hypertrichosis lanuginosa. Indian J Dermatol Venereol Leprol. 2010 Nov-Dec. 76(6):699-700. [Medline]. Beighton P. Congenital hypertrichosis lanuginosa. Arch Dermatol. 1970 Jun. 101(6):669-72. [Medline]. [Full Text]. Broster LR. Hypertrichosis: a report of three cases. Br Med J. 1950 May 20. 1(4663):1171-4. [Medline]. [Full Text]. Cantu JM, Garcia-Cruz D, Sanchez-Corona J, Hernandez A, Nazara Z. A distinct osteochondrodysplasia with hypertrichosis- Individualization of a probable autosomal recessive entity. Hum Genet. 1982. 60(1):36-41. [Medline]. Demikova NS, Blinnikova OE, Udler EE. [A case of congenital generalized hypertrichosis]. Klin Med (Mosk). 1986 Mar. 64(3):125-6. [Medline]. Freire-Maia N, Felizali J, de Figueiredo AC, Opitz JM, Parreira M, Maia NA. Hypertrichosis lanuginosa in a mother and son. Clin Genet. 1976 Nov. 10(5):303-6. [Medline]. Gardner AL. A case of hypertrichosis universalis. East Afr Med J. 1964 Jul. 41:345-6. [Medline]. Jalili IK. Cone-rod congenital amaurosis associated with congenital hypertrichosis: an autosomal recessive condition. J Med Genet. 1989 Aug. 26(8):504-10. [Medline]. [Full Text]. Janssen TAE, De Lange C. Familial congenital hypertrichosis totalis (trichostasis). Acta Paediatr. 1945. 33:69-78. Joest HR. Haarmenschen Ram-a-Samy. Z f Ethnologie. 1984. 26:433-5. Judge MR, Khaw PT, Rice NS, Christopher A, Holmstrom G, Harper JI. Congenital hypertrichosis lanuginosa and congenital glaucoma. Br J Dermatol. 1991 May. 124(5):495-7. [Medline]. Kint AH, Vermander FR, Decroix JM. [Congenital hypertrichosis lanuginosa]. Hautarzt. 1985 Jul. 36(7):423-4. [Medline]. Li ZH, Tong ZH, Luo GY, Cai HM. Congenital hypertrichosis universalis associated with gingival hyperplasia and macromastia. Chin Med J (Engl). 1986 Nov. 99(11):916-7. [Medline]. McKusick VA. Mendelian Inheritance in Man: Catalogs of autosomal dominant, autosomal recessive and X-linked phenotypes. 10th ed. Baltimore: John Hopkins University Press; 1992. Nowakowski TK, Scholz A. 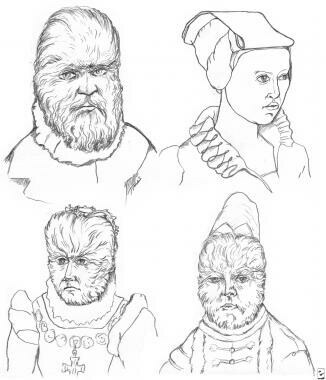 [The fate of people with hypertrichosis throughout history]. Hautarzt. 1977 Nov. 28(11):593-9. [Medline]. Partridge JW. Congenital hypertrichosis lanuginosa: neonatal shaving. Arch Dis Child. 1987 Jun. 62(6):623-5. [Medline]. Suskind R, Esterly NB. Congenital hypertrichosis universalis. Birth Defects Orig Artic Ser. 1971 Jun. 7(8):103-6. [Medline]. Vashi RA, Mancini AJ, Paller AS. Primary generalized and localized hypertrichosis in children. Arch Dermatol. 2001 Jul. 137(7):877-84. [Medline]. Chen W, Ring J, Happle R. Congenital generalized hypertrichosis terminalis: a proposed classification and a plea to avoid the ambiguous term "Ambras syndrome". Eur J Dermatol. 2015 May-Jun. 25 (3):223-7. [Medline]. Chanukvadze D, Kristesashvili J. Effectiveness of different diagnostic methods for assessment of hyperandrogenism in young women with hirsutism. Georgian Med News. 2011 Nov. 25-9. [Medline]. Hizli D, Kösüs A, Kösüs N, Kamalak Z, Ak D, Turhan NO. The impact of birth weight and maternal history on acne, hirsutism, and menstrual disorder symptoms in Turkish adolescent girls. Endocrine. 2011 Dec 16. [Medline]. Escobar-Morreale HF, Carmina E, Dewailly D, Gambineri A, Kelestimur F, Moghetti P, et al. Epidemiology, diagnosis and management of hirsutism: a consensus statement by the Androgen Excess and Polycystic Ovary Syndrome Society. Hum Reprod Update. 2011 Nov 6. [Medline]. Liu K, Motan T, Claman P. No. 350-Hirsutism: Evaluation and Treatment. J Obstet Gynaecol Can. 2017 Nov. 39 (11):1054-1068. [Medline]. Mihailidis J, Dermesropian R, Taxel P, Luthra P, Grant-Kels JM. Endocrine evaluation of hirsutism. Int J Womens Dermatol. 2017 Mar. 3 (1 Suppl):S6-S10. [Medline]. [Full Text]. Hafsi W, Badri T. Hirsutism. StatPearls [Internet]. 2018 January. Treasure Island, Fla:[Medline]. [Full Text]. Bou-Assi E, Bonniaud B, Grimaldi M, Faivre L, Vabres P. Neonatal Cutis Laxa and Hypertrichosis Lanuginosa in Sotos Syndrome. Pediatr Dermatol. 2016 Nov. 33 (6):e351-e352. [Medline]. Mendiratta V, Harjai B, Gupta T. Hypertrichosis lanuginosa congenita. Pediatr Dermatol. 2008 Jul-Aug. 25(4):483-4. [Medline]. [Full Text]. Balducci R, Toscano V, Tedeschi B, et al. A new case of Ambras syndrome associated with a paracentric inversion (8) (q12; q22). Clin Genet. 1998 Jun. 53(6):466-8. [Medline]. Tadin M, Braverman E, Cianfarani S, et al. Complex cytogenetic rearrangement of chromosome 8q in a case of Ambras syndrome. Am J Med Genet. 2001 Jul 22. 102(1):100-4. [Medline]. Tadin-Strapps M, Warburton D, Baumeister FA, et al. Cloning of the breakpoints of a de novo inversion of chromosome 8, inv (8)(p11.2q23.1) in a patient with Ambras syndrome. Cytogenet Genome Res. 2004. 107(1-2):68-76. [Medline]. Danforth CH. Studies on hair with special reference to hypertrichosis. Arch Dermatol Syphilol. 1925. 12:380-401.
von Luschan F. Ein Haarmensch. Zeitschrift fur Ethnologie. 1907. 39:425-9. Torbus O, Sliwa F. [Ambras syndrome--a form of generalised congenital hypertrichosis]. Pol Merkur Lekarski. 2002 Mar. 12(69):238-40. [Medline]. Baumeister FA, Schwarz HP, Stengel-Rutkowski S. Childhood hypertrichosis: diagnosis and management. Arch Dis Child. 1995 May. 72(5):457-9. [Medline]. Franklin DL, Roberts GJ. Delayed tooth eruption in congenital hypertrichosis lanuginosa. Pediatr Dent. 1998 May-Jun. 20(3):192-4. [Medline]. Larregue M, Vabre P, Cavaroc Y, Duriez P, Matard B. [Diffuse hamartoma of the arrector muscles and congenital hypertrichosis lanuginosa]. Ann Dermatol Venereol. 1991. 118(11):796-8. [Medline]. Verloes A, Massin M, Fransolet AC, Misson JP. Hypertrichosis, Fallot tetralogy, growth and developmental delay. Clin Dysmorphol. 2004 Oct. 13(4):247-50. [Medline]. Stengel-Rutkowski S, Murken JD, Pilar V, et al. New chromosomal dysmorphic syndromes. 3. Partial trisomy 3q. Eur J Pediatr. 1979 Feb 8. 130(2):111-25. [Medline]. Martinez Santana S, Perez Alvarez F, Frias JL, Martinez-Frias ML. Hypertrichosis, atrophic skin, ectropion, and macrostomia (Barber-Say syndrome): report of a new case. Am J Med Genet. 1993 Aug 1. 47(1):20-3. [Medline]. Salas-Alanis JC, Lopez-Cepeda LD, Elizondo-Rodriguez A, Morales-Barrera ME, Ramos-Garibay AR. Hypertrichosis lanuginosa congenita treated with diode laser epilation during infancy. Pediatr Dermatol. 2014 Jul-Aug. 31 (4):529-30. [Medline]. Belengeanu V, Rozsnyai K, Gug C, Banateanu M, Farcas S, Belengeanu A. Ambras syndrome: report on two affected siblings with no prior family history. Clin Dysmorphol. 2004 Oct. 13(4):265-7. [Medline]. The authors and editors of Medscape Reference gratefully acknowledge the contributions of previous authors, Abby S. Van Voorhees, MD, and Analisa Halpern Vincent, MD to the development and writing of this article.